So here it is, that picture of rubbish again. Except that it isn't rubbish is it? It's actually a table full of resources, a by-product of an average week's consumption. But what this table does represent is the type of stuff we used to have to deal with before I started to focus on reducing our reliance on packaged goods when I started The Rubbish Diet. It also shows the kinds of things that fill the bins in many other households in the UK. So when faced with this, how do you get rid of it wisely? Lets look at what's widely recyclable. The photo below represents the materials that are left after I've removed the items that are widely recyclable across the UK. You'll see the pile of paper has disappeared, as has the group of steel cans and the aluminium food trays. All these can be recycled through our local collection. However, some of the paper will be scrunched up to add to our compost and the aluminium trays will be kept for our seedlings. So with the cartons out of the way, the other item that can be easily removed from the table and put to good use is the collection of polythene bags. We can't put these in our kerbside collection, but we can take them to our local HWRC or drop them off at each of our supermarkets, including Tesco, Waitrose and Sainsbury's. And it's not just carrier bags, it's anything that's made from polythene including toilet roll wrappers, bread bags, frozen vegetable bags and even the wrappers that you get around fruit juice cartons. The true test is whether it stretches when you push your thumb through. If it does then it's polythene. However you still have to be careful, if the packaging says it's oxo-degradable that should be for landfill only. Also beware of compostable bags, which you should pop into your compost instead. If you don't have polythene bag recycling in your local area, the items can be collected for sending to Polyprint. 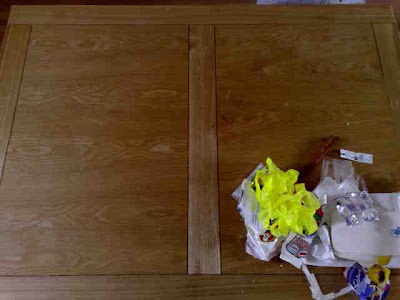 With the polythene and Tetrapaks out of the way, we're still left with a table full of potential trouble. Look at all that plastic packaging that is still in need of squirreling away. 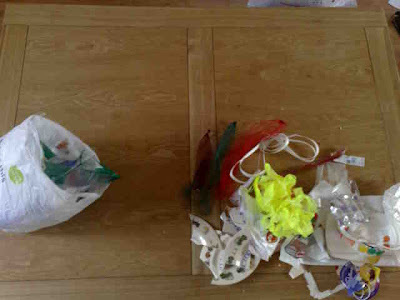 We are lucky in Bury St Edmunds in that we have excellent facilities for collecting mixed plastics. 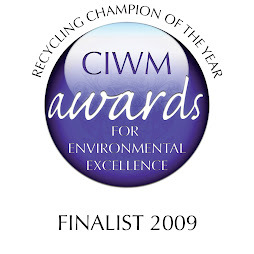 Admittedly it is reliant on waste management contracts managed by Viridor with the key recycling market based in China. Shipping this material to China is met with controversy, but I am pragmatic on this issue in that as long as UK consumers are demanding plastic goods from China, it is a viable market for our recycled resources reducing the need for virgin oil. Of course it would be more sensible if better facilities were available in the UK and indeed research is taking place to make this possible. 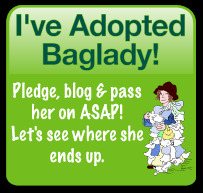 But being an impatient old girl, I have taken the trouble to reduce the quantity of plastic packaging that we have in our home by removing our dependency on certain items (e.g. commercial yoghurts) as well as shopping for things - including toiletries and cleaning products - that are either loose, refillable or unpackaged. And I also try to make more things at home as well as sourcing as many reusable products as I can. So eighteen months ago the amount of plastic packaging in our recycling bin would have been at least double what you see in the photo above and the more determined amongst you can get away with even less than that. However, I am more than comfortable with what we've achieved. 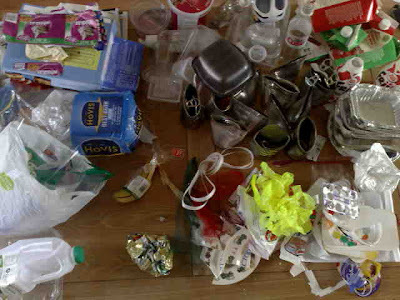 If you are unable to reduce your own dependency on such items and you don't have a mixed plastics collection nearby, help is at hand through services such as GHS, a company that Mrs Green at MyZeroWaste uses for sending packaging such as yoghurt pots. So with the mixed plastics out of the way, there's no longer much left on the table. However there is a bag of film that I need to deal with but once again, there is not much there compared to what you would have witnessed before. We used to stuff our rubbish bin full of film packaging like this, which is easily found on packets of pasta, rice and fruit punnets. Buying loose fruit avoids the film altogether as does switching your choice of carbohydrates. Where I once used to cook a lot of pasta and rice, I now buy more potatoes, so we hardly have much of this packaging any more. What's more it is cheaper, as we can get a 12.5 kilo sack of locally grown spuds from our nearest farm shop for just £4.50. As well as reduced food miles, there's the added bonus that they last us for six weeks. Who would have guessed the humble yet versatile potato could have made such a difference. And again, through the waste management contracts available, we are lucky that we can recycle the film that remains and it can be simply dropped off at our local Household Waste Recycling Centre at Rougham Hill in Bury St Edmunds. 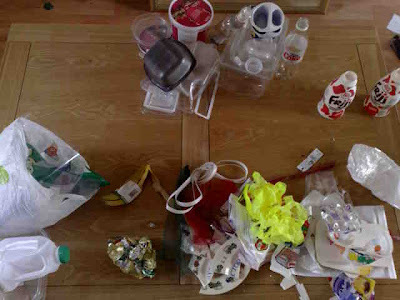 And that's last week's rubbish, featuring the tops of the takeaway containers, a few ice lolly wrappers, a foil lined plastic blister pack and some yoghurt top lids as well as some scrunched up yellow tape. 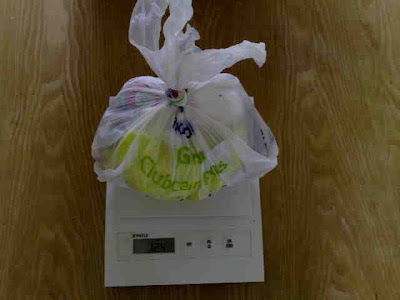 And look, it fits into a really tiny bag, weighing just 128 grammes. That's not bad eh. And for a Maximum Waste Week, I'd say that was a real result! So after everything I've learned over the last twelve months it looks like my habits are now pretty well formed. I don't think I could ever go back to my old ways, do you? To find out more about what you can recycle in your area, visit www.recyclenow.com. 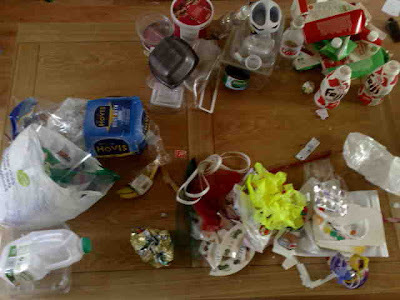 Better still, see what changes you can incorporate into your own lifestyle identifying new choices that reduce the need to recycle in the first place. There are lots of links in the sidebar that can help. As said your facilities seem to be better than most. I can take most of our recycling to our HWRC, so we don't have an awful lot that now goes into the lanfill bin. It's very funny to see how easily things disappear from the table, and very good to know that a so small quantity goes in landfill even in the case you buy a large amount of product as in last week. I think you shouldn't to go back to old habits! It's great to show people step by step how they can reduce their weekly waste. Very inspirational stuff and I think you will get lots of people thinking more about their rubbish and how to deal with it. A very good coverage of the topic, Mrs A. My memory of the old ways before Zero Waste was the amount of waste and the powerlessness to reduce it while shopping at supermarkets. Fortunately, there are more and more ways to avoid this waste. By highlighting the issue, more people will appreciate the benefits of sustainable waste.